Headlines: What a mixture of conditions we have had! Howling gales one day, crystal clear and still the next. The fishing has been quite good for those that have ventured out on the better days. Lake Eucumbene:- Reports have been filtering though over the last week or so with few fish caught in the river mouth area. After dark is the best time to fish this area. There have been some good conditions over the weekend for polaroiding but no reports as yet. The Western shore and the dam wall are the places to have a search. Most big dark streamers like a Fuzzy Wuzzy, Woolly Bugger or Black Phantom will work after dark at this time of year. Fishing late into the night can be a cold option but there are some great rewards to be had for those who are keen. Lumo patterns are still worth a go this week. Lake Jindabyne:- Bit of mixture of reports with some anglers getting some good numbers while others have missed out. Early mornings have produced a few fish. Best flies to try this week are Lumo's, Woolly Buggers, Hammils Killers and Fur Flies. Best areas are Kalkite , Hatchery, Creel Bay and East Jindabyne. Polaroiding has been quiet despite good conditions with a couple of anglers covering a lot of ground seeing nothing. Fish have been caught during the day searching with small streamers but it seems a little early for finding fish at this stage. This will change over the next few weeks as fish drop back into the lake from the river. Best flies for the polaroiding include Stick Caddis, Jinde Cased Caddis, Black and Peacock Spider, Woolly Bugger, and Bushy's Horror. *Pat Kennedy from Queanbeyan braved some atrocious conditions last week and was well rewarded with a beautiful 67cm Atlantic Salmon. The fish jumped several times and fought very well. The fly that did the trick was a beadhead Damsel nymph pattern. Lake Tantangara :- No reports on fly but the lake has risen slightly and would be well worth a fish on a good day. Eucumbene:- Trolling has been a little hit and miss with one group cleaning up and the next hardly getting a touch. That's fishing I guess. *David Cosson, Warren Fenner and his eight year old son Mitchell, all from Orbost, had a very productive few days out from Braemar and the Dam wall area. Lauching at the dam wall they trolled a mixture of flat line Tassie Devils and RMG Scorpion # R11 for 19 fish to 1.25 kg. The fish were mostly Rainbows and despite catching a few smaller ones the majority were kilo-ish fish. They caught a few Browns also. The best area was around the powerlines and in deeper water rather than close to the bank. They fished the river mouth hard but it was quiet. They also commented that there was hardly another boat to be seen. The fish are there and obviously on the chew. Covering as much country as possible with a good array of different depth lures fished at a good speed should find a few fish. *One group fished the lake hard on the weekend and caught only one fish on a #55 Tassie. *Hi Tom, My two young sons and I caught a 2kg Atlantic Salmon at Curiosity Rocks at Jindy last Sunday 10 mins before dark  using a spoon lure. 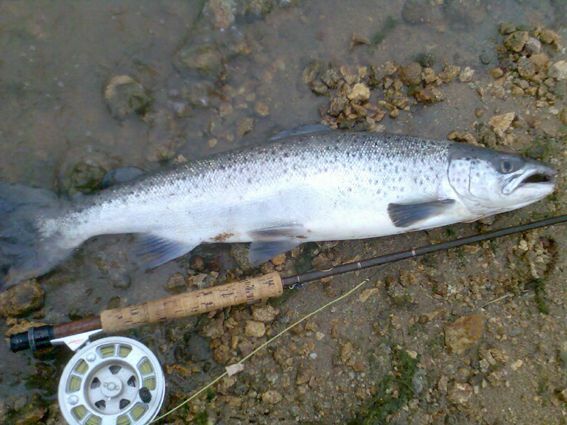 A nice fish in reasonable condition. There are fish to be caught in Jindabyne but based on reports this week it seems as though Eucumbene could be a better option. Baitfishing :- Bait fishing reports have been quiet also. Scrub worms on the bottom will work at the moment along with Sherbert and Lime Twist Power Bait. There will be some great fishing for Rainbows in the next few weeks in both lakes with some really fat fish in Eucumbene and some nice ones in Jindabyne as well. Best areas in Eucumbene would be The Dam wall, Old Adaminaby.